Please post on Joomlacode tracker. We are not using github yet for CMS tracker/patches. I think it will radically change the quality of code and lower the barriers to entry for contributing. For example, this pull request I made without ever downloading the code, I did it all in github as I was browsing, people can instantly see the diff and could merge it easily (if they wanted) or comment or reject it. Hi for now can you just please use the playground. But the point is to make stuff available so others can practice and learn since we will no move until everyone feels comfortable. in the meantime, correct as posted all over, please don't use this for real work yet unless is ti a 2.5 feature. The tooltip's description for the 'Show On' field is not showing because it is currently looking for the label. * Rename "Field Category" to "Field Group"
* Revert "Display fielg group label when editing a group"
* only a logged users (with user id) can be root. moved the captchaEnabled var out of the default.php file to the view.html.php file. 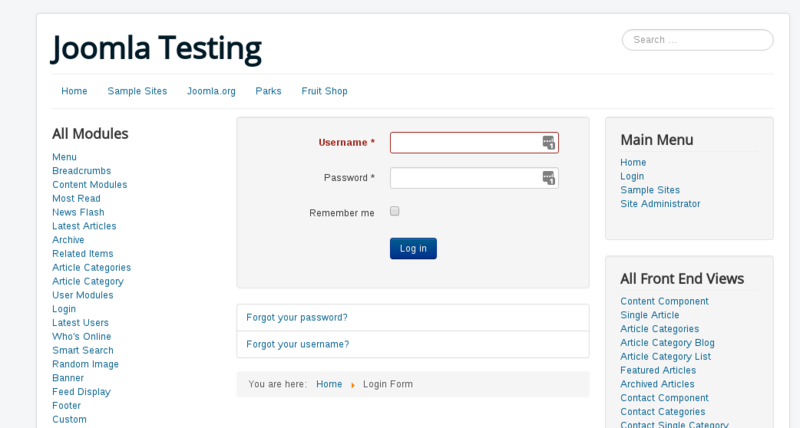 Minor fixes on proper use of Joomla! 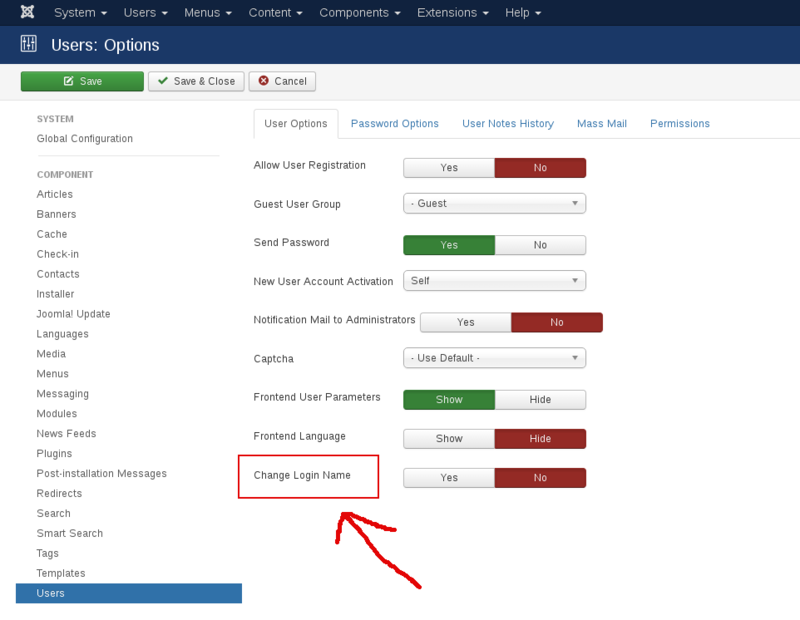 The language label "Change Login Name" is not consistent with the front-end label "Username". This PR changes the language label to "Change Username" and the decription to "Allow users to change their Username when editing their profile." 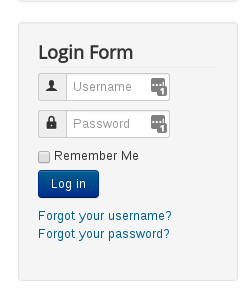 The front-end login screens use the label "Username"
The last entry is "Change Login Name"
+ hover description "Allow users to change their Login name when editing their profile." The last entry is "Change Username"
+ hover description "Allow users to change their Username when editing their profile." Revert "css fix thanks @C-Lodder"
Revert "rename liszt: chosen: and add JUI hacks"
When adding the scheme to an URL use correct scheme (http or https) and port. Checking for "http" or "https" via strstr() in the URL matched also these strings embedded in the URL (e.g. in /static/http/index.html), due to that checks changed to strpos(). At present the sorting by date has the options to sort the articles by Published Up date and Created Date. Adding another sort option to sort the articles by the Modified Date has been added. This addition would be of help to list the articles that are modified recently. Added the following language string that would be used in the xml file of the module mod_articles_news. * Updated installation language files. * Fix of an error "Only variables should be passed by reference"
* simplify code. Thanks Thomas. Rearrange union > unionAll > order to render a valid query when all these three are used together in a query. Fix return type in method doc blocks. Update test case for the JDatabaseQuery::toString method to test all the element for select query. 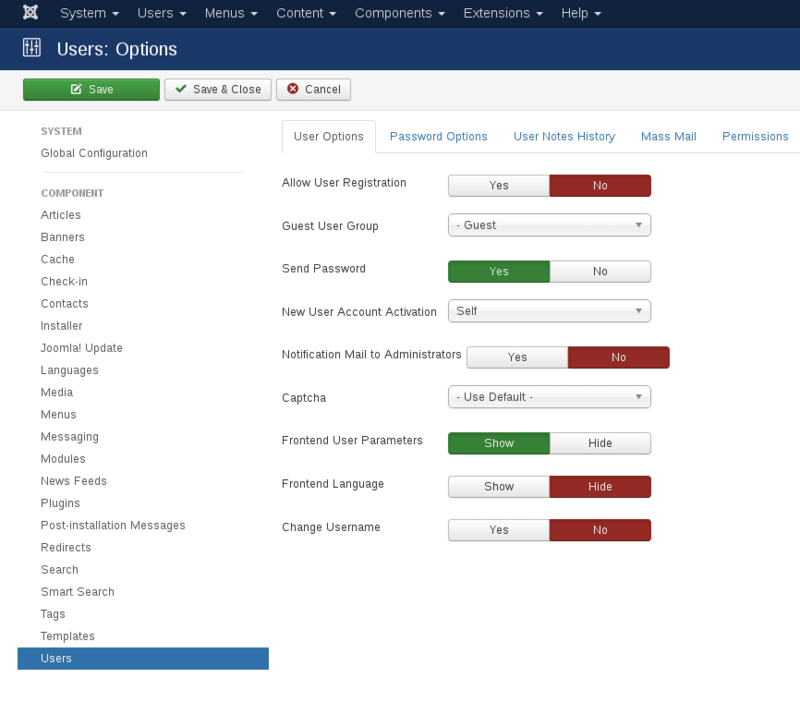 * Introduce new method isClient($identifier) in JApplicationCms class as a substitute for isSite and isAdmin methods. Hence, remove usage of descendant class reference in the JApplication (legacy) and JApplicationCms for better OO structure and support more extensibility. * Fix, null == 0 passes. Avoiding strict check to allow use of '0' or '1' as string as well as integer. * Removed support for integer argument which matched client_id as discussed with @mbabker, thanks. Works if onload event is already fired when script is executed. to after the onload event. * simple correct to work with new script attributes PR (11289). Adds auto version hash. * ident with tabs, not spaces! * show sef in module assignments. * * Show configured upload limit when uploading installer package. Otherwise when uploading a larger file than the configured limit, the page reloads without any information about what went wrong. * Show upload limits for file input everywhere. Refactor the calculation part to JUtility class. * Will be replaced by $html5 and the default value will be true. Just a small typo in the comment. Removing old content that has been moved to a dedicated page on the Joomla! Documentation and adding a link to new contributors page on GitHub. * Mark _autoload function public. The method is supposed to remove all instances of <fields> element but it exits the loop on first iteration only. Looks like a quick copy-paste from removeField may have caused this.